1. Place the slaw, carrot, peppers, cabbage, apple and cauliflower in a large bowl. 2. In a blender, combine all sauce ingredients and 2 tbsp of the water. Blend to combine, then test thickness. If the sauce is too thick, add more water, a little at a time, until desired consistency is reached. (The veggies will release some liquid, too, so try to keep it thick! 4 tbsp was too much water for us). 3. Pour the sauce over the vegetables in the bowl and toss to combine well. Plate the veggie mixture and top with coconut. Will keep in the refrigerator up to 2 days. I remember this dish! It was great! Loved this post! Pad Thai has been on my list of dishes to make, I collected recipes on a folder, but now the one you linked to (Rob’s site) is at the top of the list. 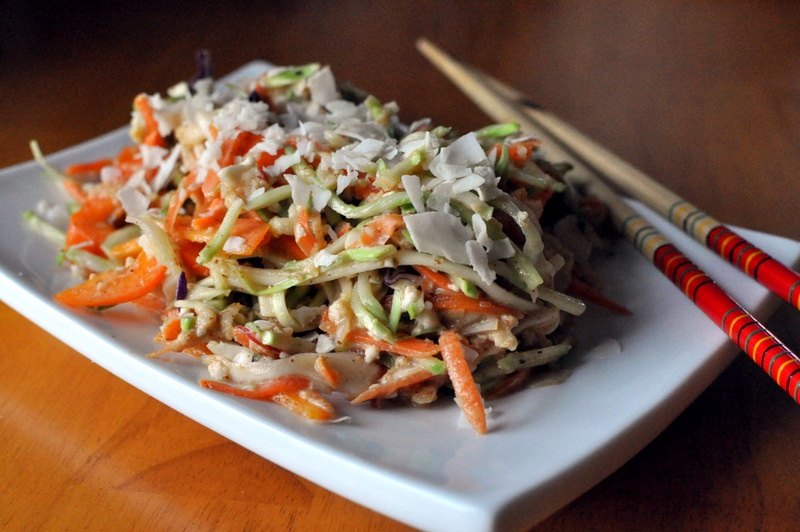 I love Pad Thai and I love coleslaw – so I think this would be a winning recipe all around! That sauce for the veggies sounds so delicious, no matter what you call it! I haven’t had pad thai in forever…but to honest, I’d so much rather have this! Thanks for sharing this on Wellness Weekend – my mouth is watering while reading the recipe! This sounds amazing! I love sauces made from almond butter, and I’ve been wanting to try the raw pad thai at Thrive too! Whatever you call it, I’d love to eat it. 🙂 I hate having to thinly slice vegetables though. Maybe I need a spiralizer too haha. It looks like a great recipe to use my spiralizer on–so vibrant. 😉 Thanks for sharing it with Souper Sundays. 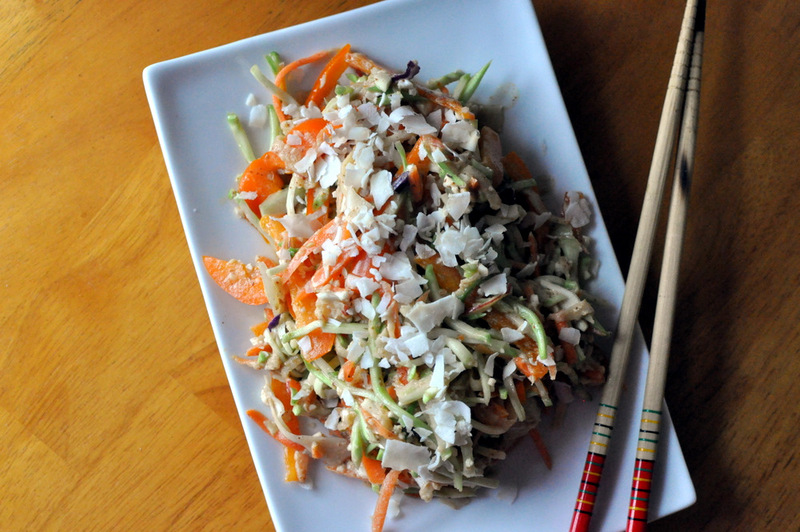 i love this coleslaw dressing! i think hubbs is going to love this crunchy pad thai! I like the sound of a pad Thai coleslaw! Looks gooood 😀 – keep looking through your raw recipes and finding amazing things 🙂 . Thank you!! Going to be trying more and more!! The recipe mentions that “tamarind concentrate” is the ‘secret ingredient’ … but…I don’t see it in the list of ingredients, nor in the directions! ?? Is it put in the sauce, I suppose?